We’ve been patiently (or restlessly) waiting for a compact Buick crossover — something that would fit nicely between the subcompact Encore and the full-size Enclave. And lo and behold, such a vehicle has been spotted undergoing testing. The CUV in the photos will likely carry either the Buick Envision, Enspire, or Anthem name — all of which GM has trademarked or is in the process of trademarking, and will ride on the D2UX variant of GM’s next-generation D2XX vehicle architecture that, as part of GM’s global platform consolidation strategy, will merge the compact Delta car architecture with that of the compact/midsize Theta CUV architecture to underpin as many as 12 nameplates. 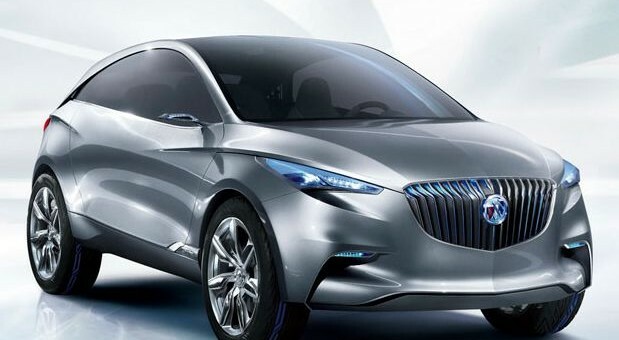 In addition, the compact Buick CUV seen in the spy pics will share its platform with the next-generation Chevrolet Equinox, and given GM’s alignment of the Buick and Opel/Vauxhall brands globally, we expect the Buick to be analogous to the next-gen Opel/Vauxhall Antara, much in the same way that the Buick Encore is equivalent to the Opel Mokka, and the Regal is to the Insignia. Notably, Buick almost released a compact CUV back in 2009. Based on the discontinued Saturn Vue (and its Theta platform), the vehicle was cancelled before having the chance to see the light of day due to poor pre-debut feedback, and the automaker then decided to repurpose the Vue as the fleet-only Chevrolet Captiva Sport. The D2UX-based prototype unit seen in these pictures sports door-mounted mirrors, what appear to be projector-beam headlamps, and a peculiar cylindrical-looking device mounted to the crossover’s roof racks. While it’s difficult to determine its purpose, Autoblog mentions that the device looks similar to the 360-degree Lidar camera equipment utilized by Google in its autonomous fleet of vehicles, leading some to venture that General Motors might be collaborating with Google on autonomous car technology… or possibly even developing it by itself. Captivating… unless you’re one of those crazy people that loves to drive. Check out the photos at Autoblog… complete with the driver flipping the camera crew the bird. Next story How Does The 2014 Malibu’s Improved Rear Seat Legroom Compare Against Its Rivals? This vehicle has no reason for being. Equinox and Terrain are doing great so other than the fact that GM can’t resist going back to its old badge-engineered, every line gets a version of everything ways., what purpose does a Buick version serve other than to cut up the segment a little finer and steal sales from Chevy dealers? We obviously cannot tell precisely what the D2XX crossover will look like, but we can surely tell (if this is it) that it will bare no resemblance to the Envision Concept, and that is a huge disappointment. Seeing through the camouflage to the basic shape, this just looks like another run-of-the-mill CUV, sized to compete with the CRV, Escape, etc. GM really, really needs something with some flare, otherwise Alsloan will be correct. It won’t attract customers of other brands, and might simply shift LTZ buyers away from Chevy to a Buick. Other than the Corvette, Camaro, and maybe some Cadillacs, the GM line to my eye is rather bland. I’ve seen nothing on the horizon to change that perception. It’s clear to me that GM is still being run by a much-too-old group of ultra-conservatives. As long as they stick to high quality this approach will keep GM alive, but it will not lead to much growth. I still want to know why GM wastes its money building concept vehicles for auto shows. So it creates a temporary buzz among reporters, but then a letdown for customers when the real product gets released. Next time I see a GM concept vehicle I will know what NOT to expect. That is how it has been done for years. Then GM and Chrysler tried to build the cars just as they were shown like the Camaro, Solstice, SSR, Prowler and PT Cruiser etc. Once they did that then everyone complains that they can see out of them due to poor sight lines. They complain that they have to open doors to adjust the seats etc or have no trunk due to a fuel tank in the way. The fact is most show cars are to gain attention and show case ideas but seldom are they meant to go production nor in many cases should they. With safety standards as they are and the reality of bending metal with out costing a fortune and other needs in ergonomics that tend to be important to many customers today making the car usable is the first priority. You can play games with a low volume car like a Viper but in a main stream SUV or sedan you had better make the car usable and easy to drive and have a 5 star crash rating. Anything less will feel the bane for the public. It is sad to say people anymore put practical things far above styling anymore. How else could they sell so many Camry’s and Civics. I don’t like it but in todays game you can’t fail on too large of a scale anymore or you can bring a company down fast. We have yet to see the loss of our last auto brand. Word is Dodge may be merged into Chrysler by Fiat. Anyone notice the driver is giving the middle finger? We want real Buick styling. enough rebadged Opels. The rotating camera double on the roof rack might be a tool for testing, giving exact data for inclincation of the car in curves, and different conditions of the terrain. What’s with so many new vehicles having the door mounted mirrors and the tiny vent window in the front door? I hate the way it looks, and even if the rest of the vehicle looks like the beautiful Envision pictured above, it’s enough to kill my interest. They’re called front quarter windows, they’re fixed and therefore don’t act as a vent, and they exist because the door’s hinges are directly beneath it and putting the windows down would interfere with them. And you’re right, they also look awful and they are deal breakers for me. Not only would the window not go down but if they were blocked off they would make a blind spot even larger. Get used to them as they are going to become more common in most makes and models as no one will make the windows not go down and as the windshields get laid back more and more. I am not thrilled by them but understand they have little choice. Keep in mind the drawing here is just that a drawing so the real thing may be similar but less dramatic. Generally drawings like this are not realistically producible at a reasonable cost or would pass a crash or roll over test. If anything this may be a sign the Nox and Terrain may not be too far out as some think. Note too on the size that it can vary as the Captiva now is not as large as the Nox so GMC could be making the Terrain larger than the Buick. Before anyone jumps the Shark here I would recommend seeing it in final for uncovered and maybe even in person. Once you see the real thing and have an informed opinion. My take is: By looking through the camo. there are discernible lines in the body work to make me think more “baby Enclave” than anything else. I like what I see too, as for as much as I like the Encore it is a bit too small for my tastes. I say call it Envision too. 2015/2016 seems like a long wait for a model that is badly needed to fill the slot between the Encore and Enclave. The vehicle looks to be pretty far along in development testing. Judging by this I’m guessing it’ll be a Chicago or NY 2014 auto show debut. Word from the Photographer that this may a China only model or at first. I expect it here but we may not get it first. Also with the Nox and Terrain already selling near 300,000 units in the North American market right now GM is not hurting here. The new ones when they arrive will only reinforce the strong sales. Good point. I’m not in the habit of thinking about Shanghai as a major show. I gotta reinforce that, especially with Buick’s importance in China. The Solstice is still the best looking design GM has produced in some time. Styling will still be reward with strong sales, if done right. The Hyundai’s are on fire with their radical styling, and every manufacturer is rushing to duplicate it… Even Mercedes. I would like to add that by all accounts the z Hyundai styling covers up serious ride and suspension flaws, proving that “practical”is in the eye of the beholder.